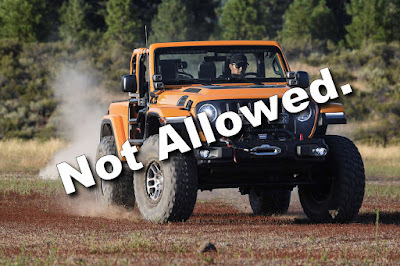 Is There Legal Basis for the LTO's Crackdown on Modified 4x4s? 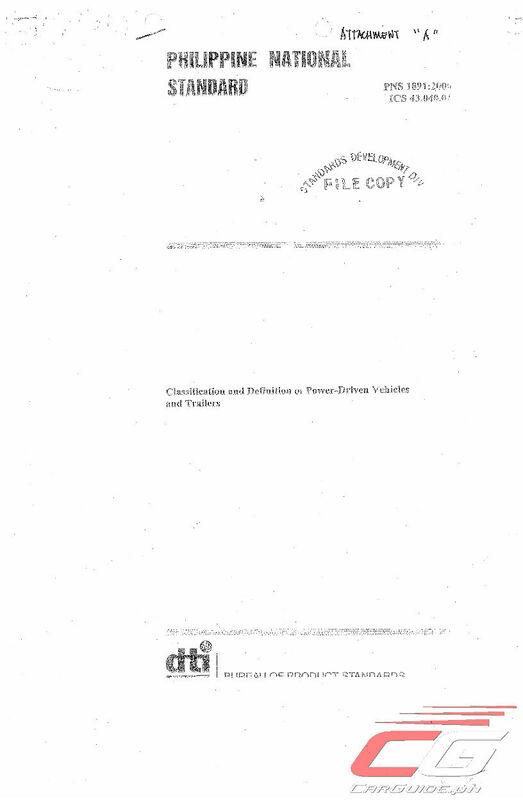 It took us a while to get into this issue mainly because we didn’t want to sound like a spokesperson for the DOTr or the LTO. 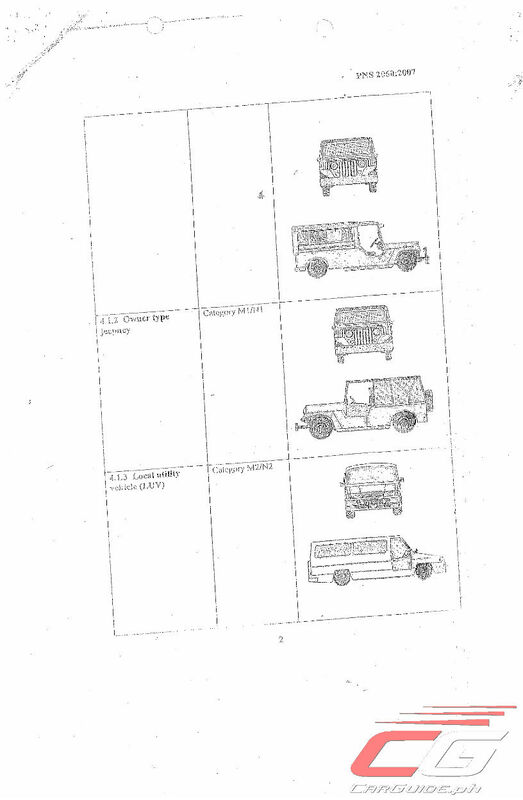 Thus, we had to dig deep and find out for ourselves the legal basis (if any) for the LTO’s apprehension of modified vehicles, especially 4x4s and off-roaders. 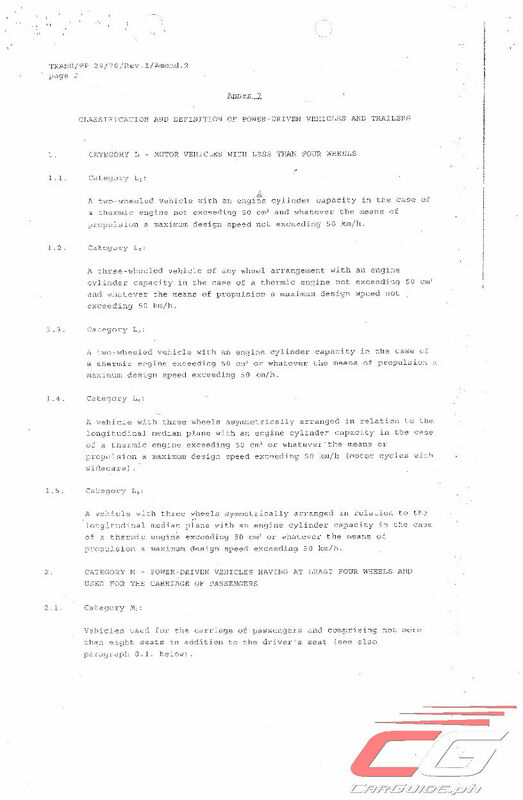 The first issue here has to do with the installation of auxiliary lights—the LED kind or otherwise. 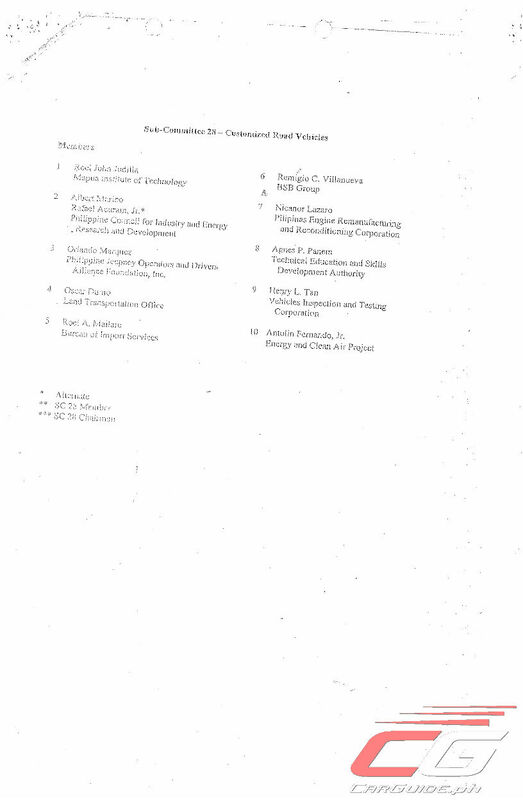 The issue has already been discussed in detail before and we were even quoted by the LTO themselves as a source (spoiler alert: it is no issue on certain grounds). 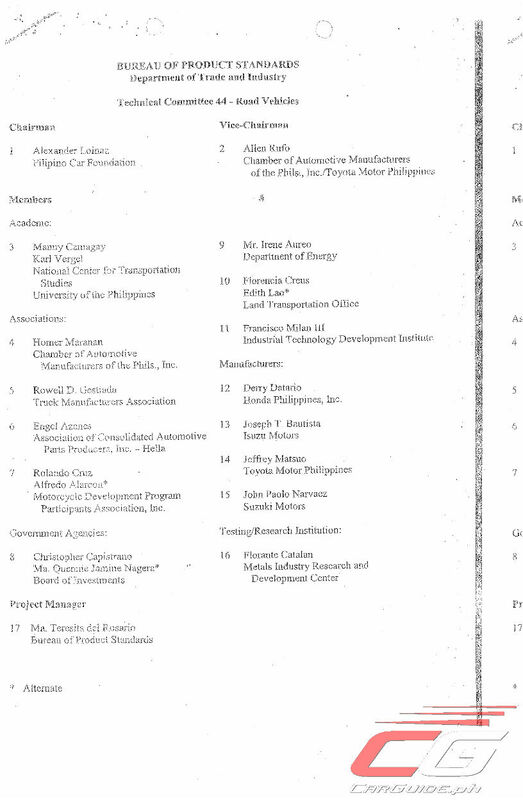 Now, let’s get to the main matter at hand: the DOTr (or more like its predecessor, the DOTC)’s Department Order 2010-32. 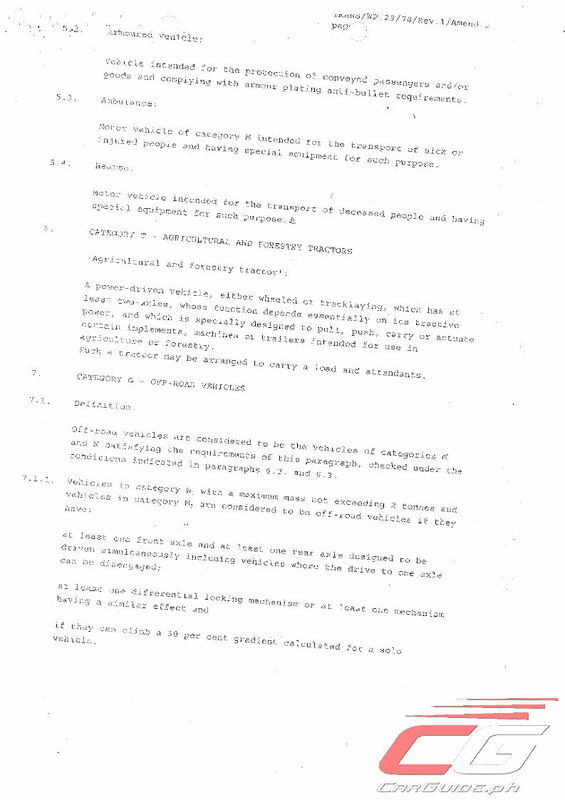 You can get the full copy of the Department Order below including all the pertinent annexes, but let’s focus on the juicy bits. 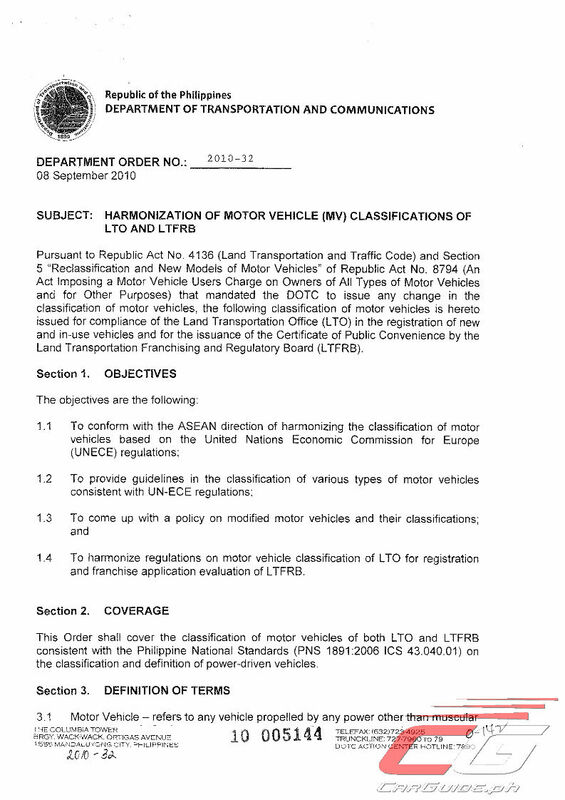 The said Department Order, entitled “Harmonization of Motor Vehicle (MV) Classifications of LTO and LTFRB” outlines how the DOTr, though Republic Act No. 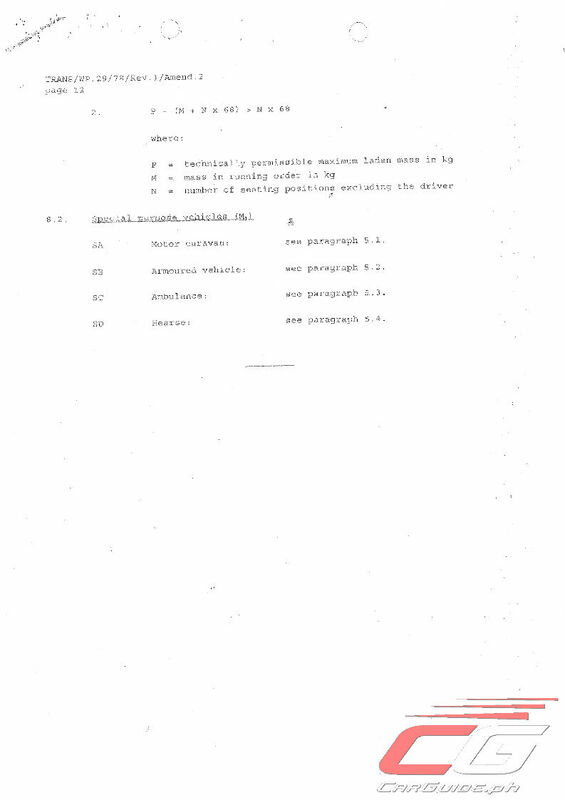 4136 and Republic Act No. 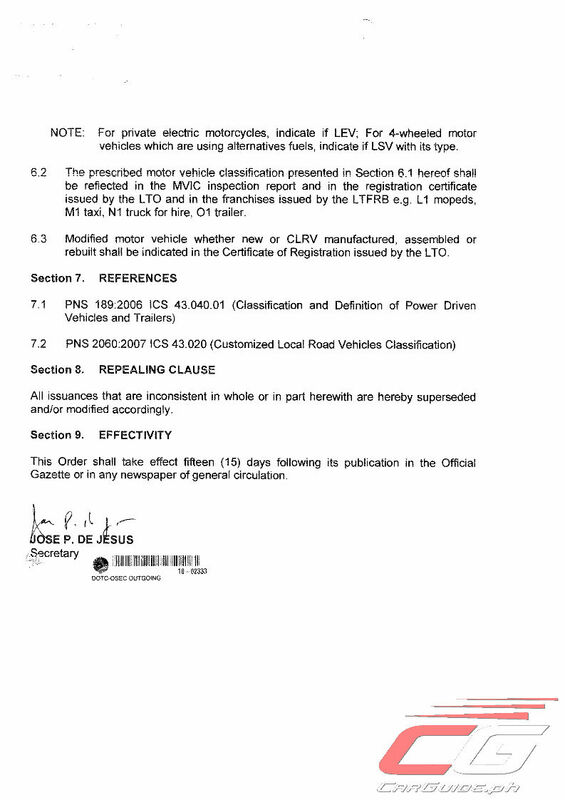 8794 has given them the authority to “issue any change in the classification of motor vehicles” including its compliance for registration (both private and public) and its conveyance for public use. With Department Order 2010-32, the DOTr says it is aligning itself in terms of regulations with the United Nations Economic Commission for Europe (UN-ECE) standards just like our ASEAN neighbors. 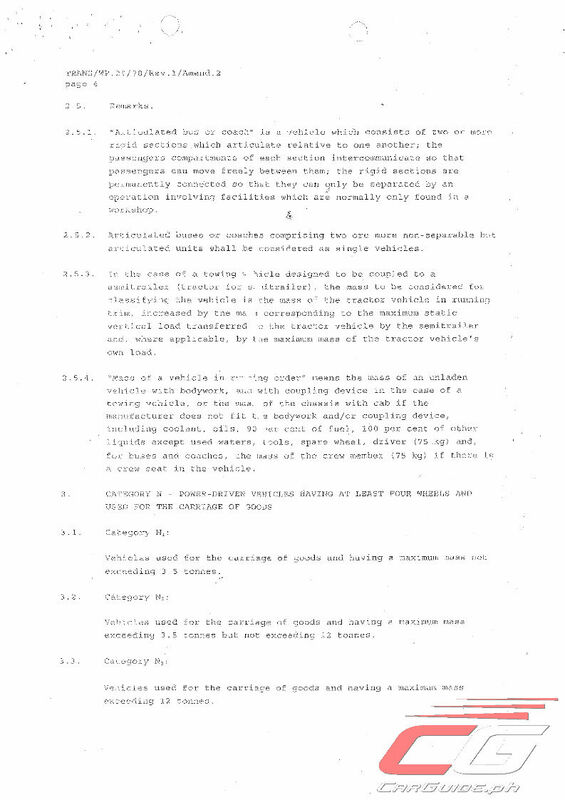 You can read the full document here, but here two interesting bits. 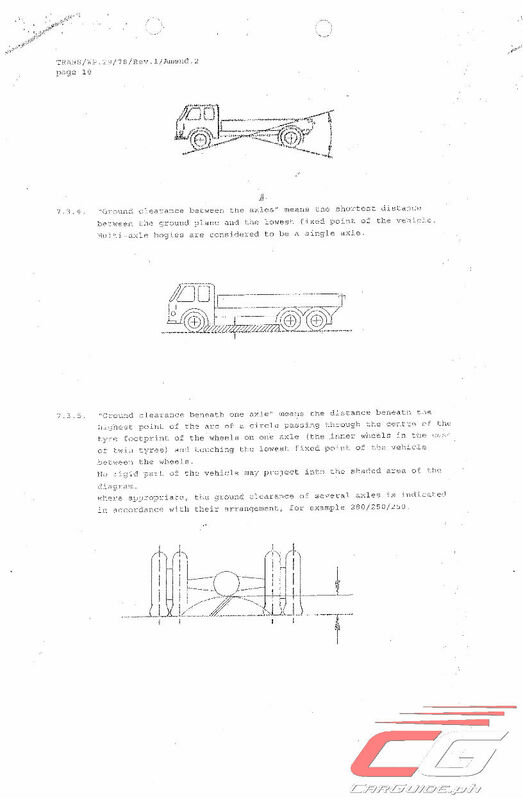 The ground clearance between the axles shall be at least 200 mm. 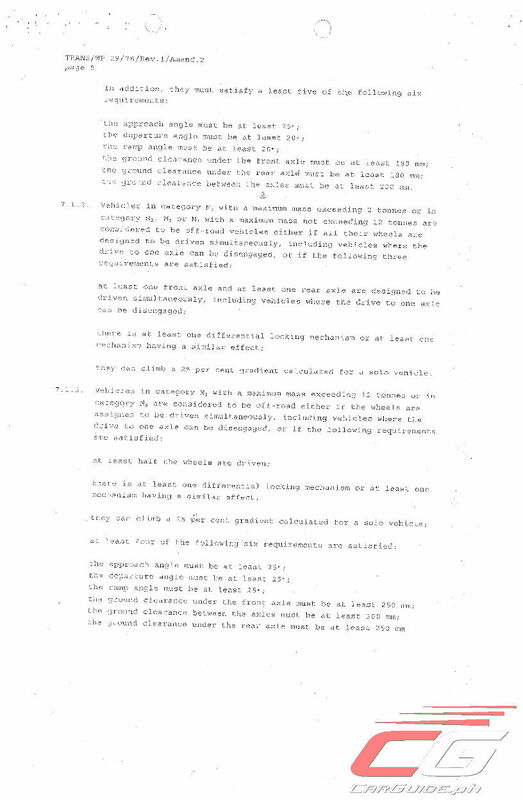 Headlamps and other front lamps should not have rigid projecting frames. 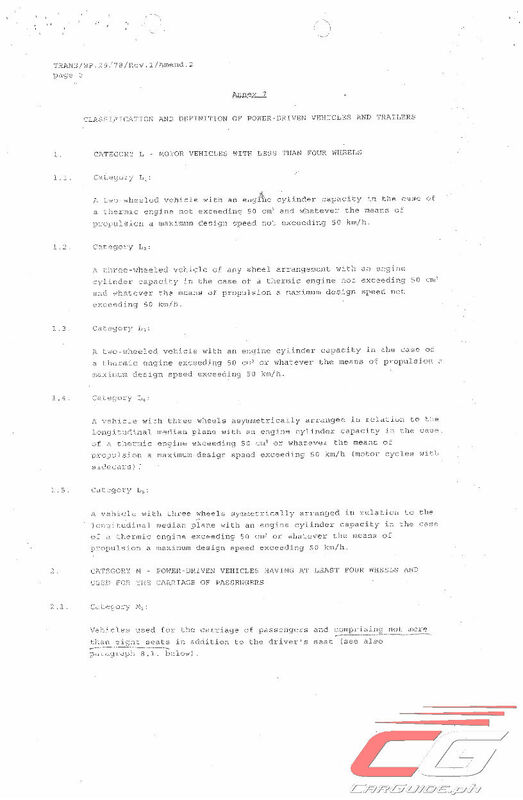 If possible, they should be mounted slightly recessed in the bodywork. In an accident with a pedestrian, the area of initial contact with the legs of the person struck should be below and forward of the conventional bumper. It should extend over a vertical height sufficient to distribute the force over the legs, preferably below the knees of an adult person. External accessories (trimmings, spoilers, etc.) should be deformable, retractable so as to minimize the risk of injury. 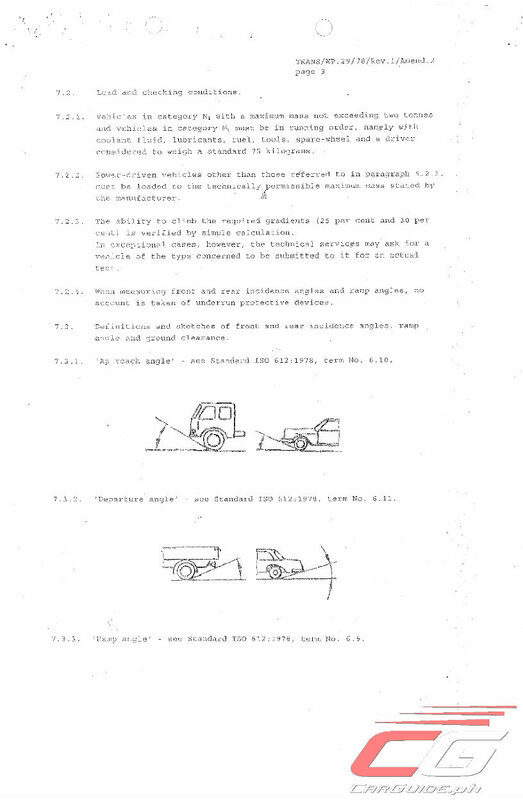 The DOTr’s alignment with the UN-ECE standards put things like rigid steel bumpers, raised chassis, and wide tires—some popular 4x4 aftermarket bits in a precarious situation. 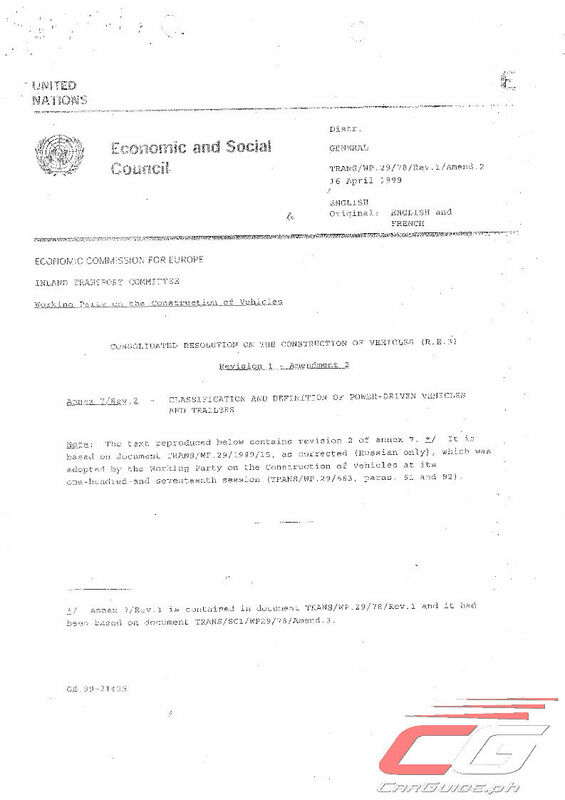 Clearly, these do not pass the mandated requirements of the UN-ECE. 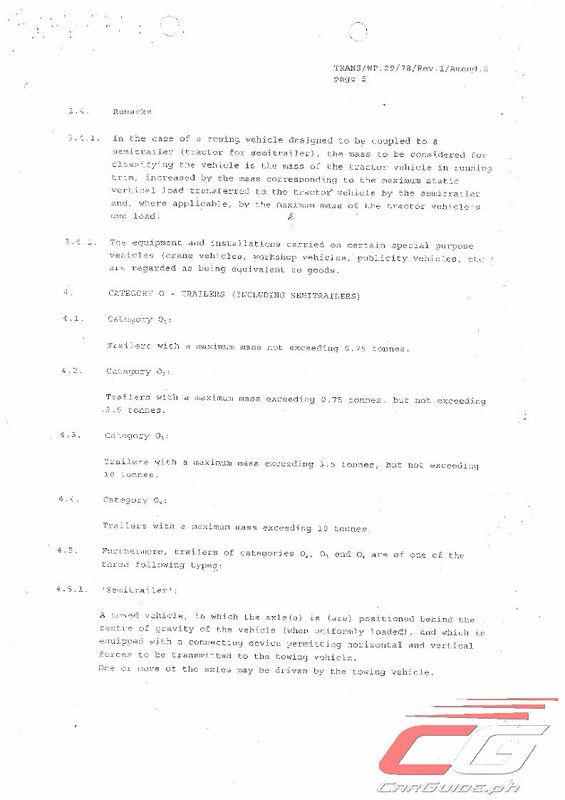 And while some may construe that that the UN-ECE standards covers only new vehicles and not aftermarket fitments, no where in the regulation does it say otherwise. 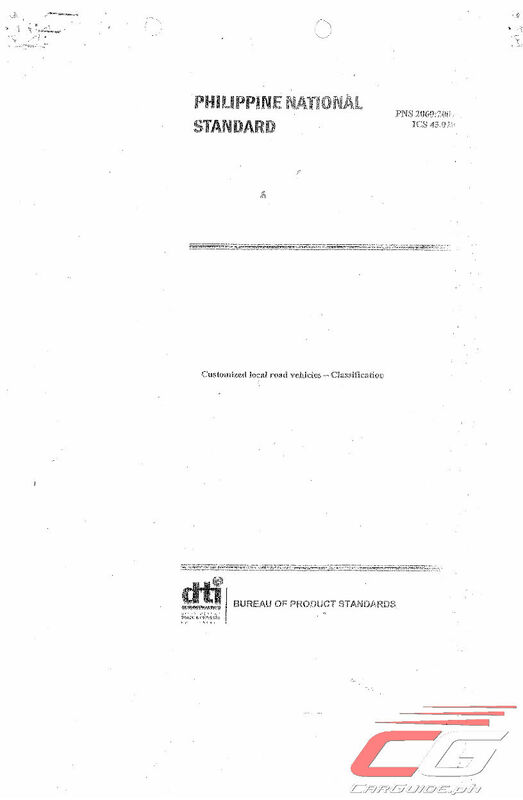 In fact, a part of the standards cover unauthorized parts or equipment. 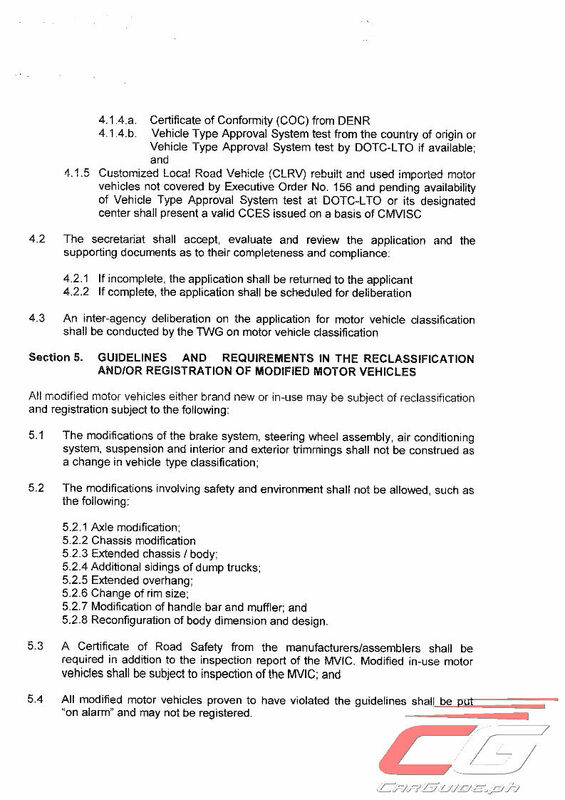 Aside from an alignment with UN-ECE standards, the same Department Order has given the DOTr to police modified motor vehicles. Now, this is where all the problems, questions, and vagueness are coming from. 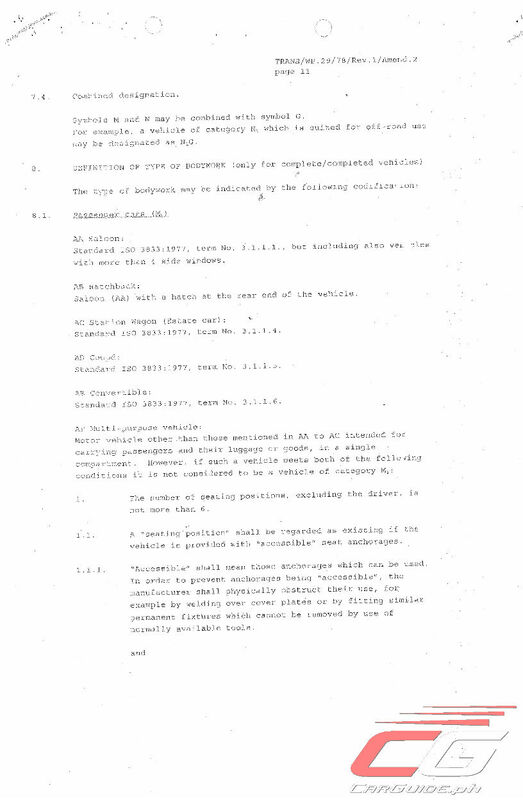 For the DOTr, they classify a motor vehicle as modified if it has “any physical change or alternation in the existing motor vehicle design such as body configuration, engine displacement and others” and these are subject to a possible reclassification. 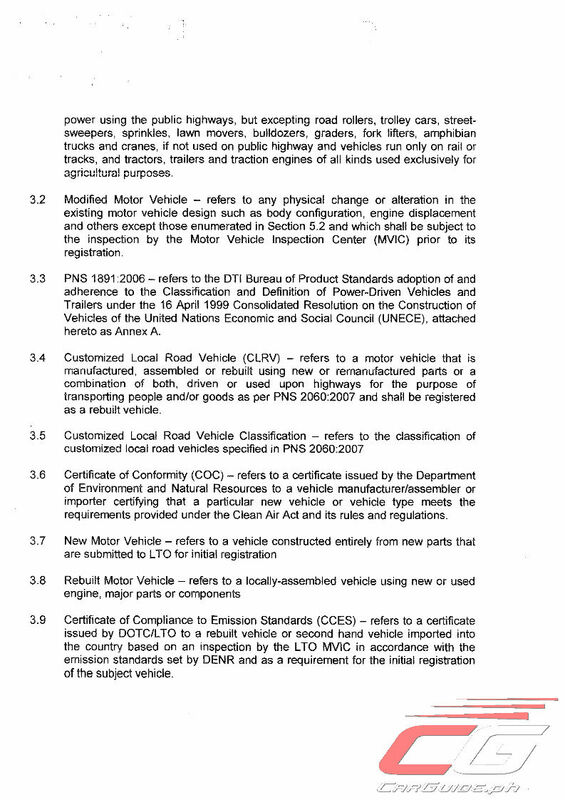 These changes will require a Certificate of Road Safety from the manufacturer/assembler and will be required to be re-inspected by the MVIC. Otherwise, violators shall be put “on alarm” may not be registered. 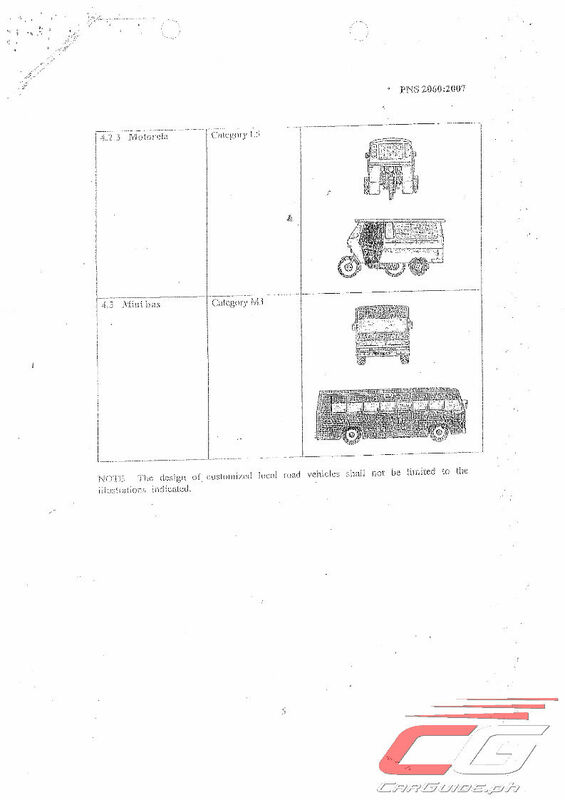 So what about those jeepneys? Well, glad you asked. 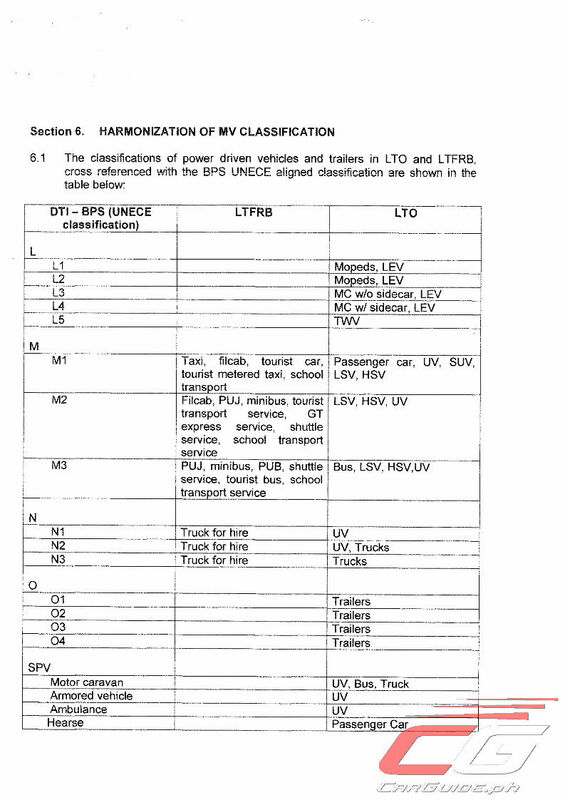 These are not considered as modified motor vehicles, but as Customized Local Road Vehicle (CLRV), this re-classification is a power given to individual governments to cover for gaps in the UN-ECE standards. 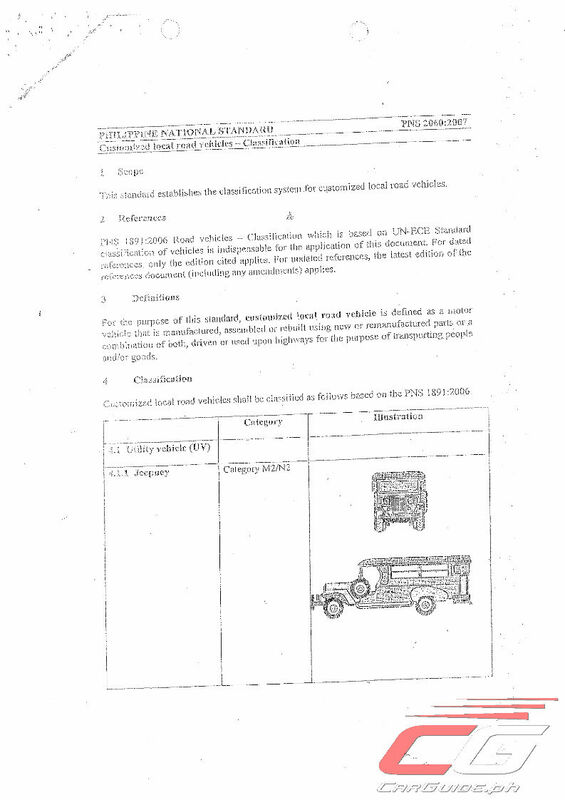 Locally, these CLRVs must indicate that they are a “rebuilt vehicle” in their Certificate of Registration. 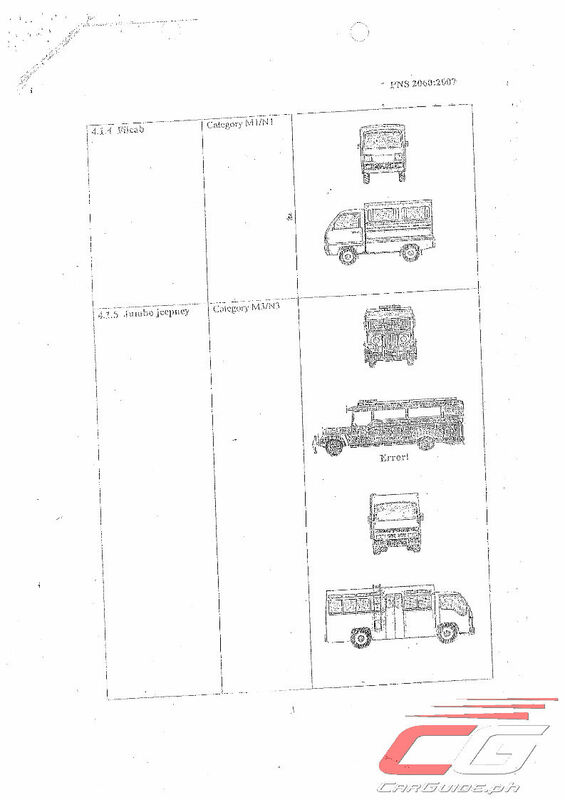 In addition, the Department of Trade and Industry (DTI) did come up with Philippine National Standards (PNS) that covers jeepneys, owner-type jeep, and the like. 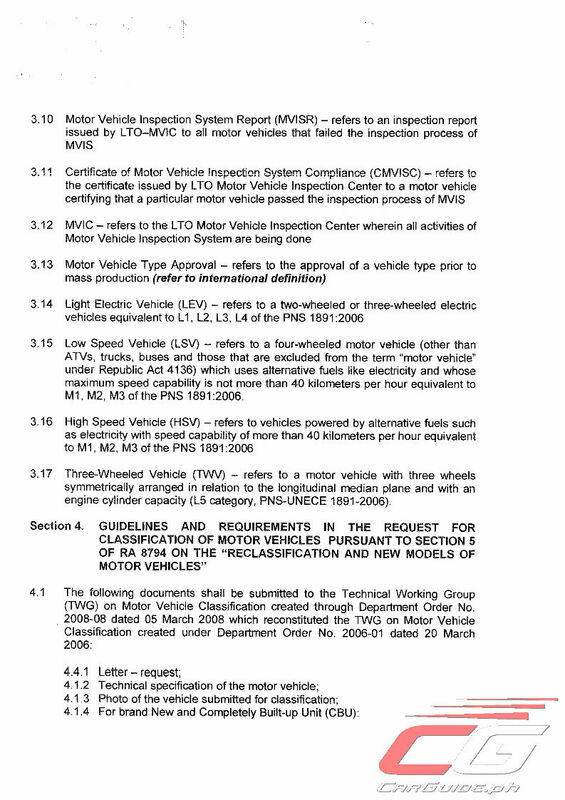 Given the laws and regulations in place, the LTO does have the mandate to run after heavily modified vehicles. However, while we don’t question their legality in trying to make our roads safer, it also puts into question if this is simply a case of arbitrarily implementing the law. 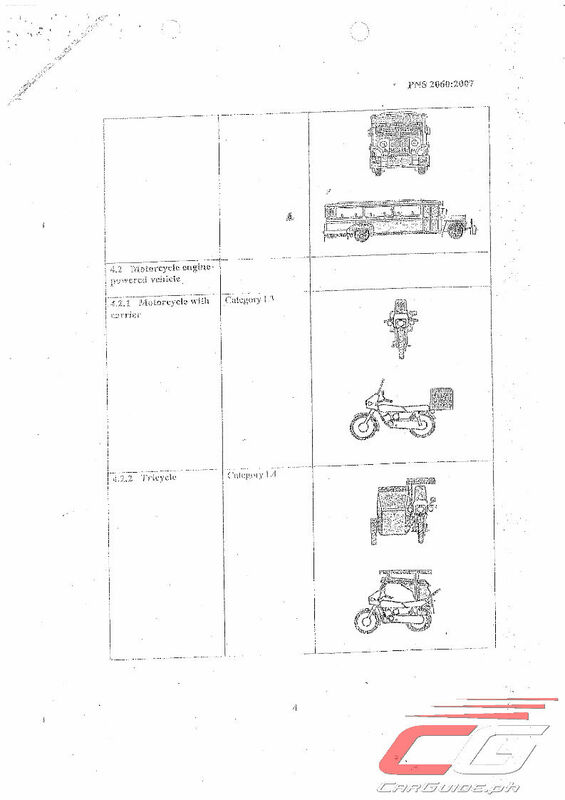 Some have pointed out that the LTO’s efforts could be put to better use such as catching those with illegal blinking taillights or removing road unworthy and dilapidated vehicles off our streets. Maybe that’s just too much work and it’s easier just to stick to the low-hanging fruit for now. Are tow hitch receivers with tow bars allowed? Dura lex, sed lex. I suppose the illegal became status quo because no one was enforcing, and most are too dumb to even bother looking it up. Hopefully the start of order. Yaman din lamang na hinuhuli Yung mga off road modified vehicles, hulihin niyo na Rin Yung mga tindahan nagbebenta ng mga off road accessories. 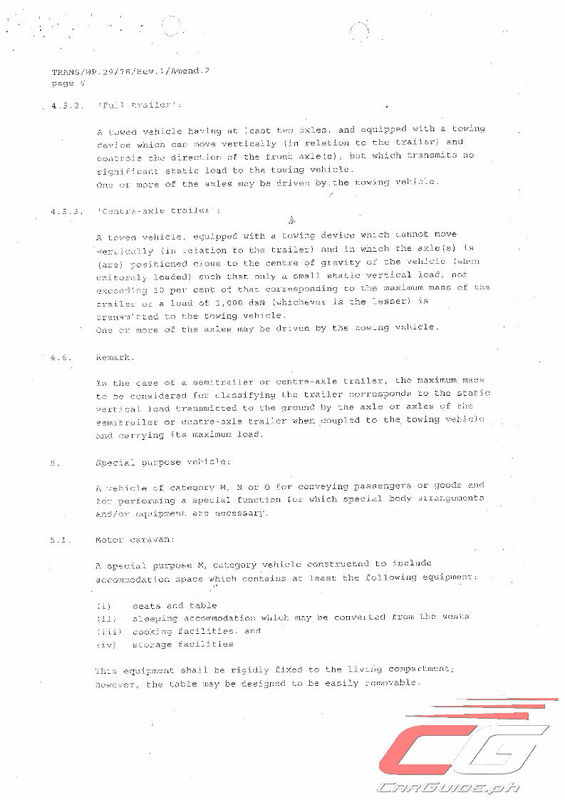 Ipagbawal na Rin Ang paggawa at pag import ng mga off road vehicles AnD accessories. Ganyan dapat Ang gawin Kung talagang seryoso Ang Gobyerno sa kanilang ginagawa. Baka naman nagpapasikat Lang yang mga namamahala sa LTO para sabihing may ginagawa silang makabuluhan. 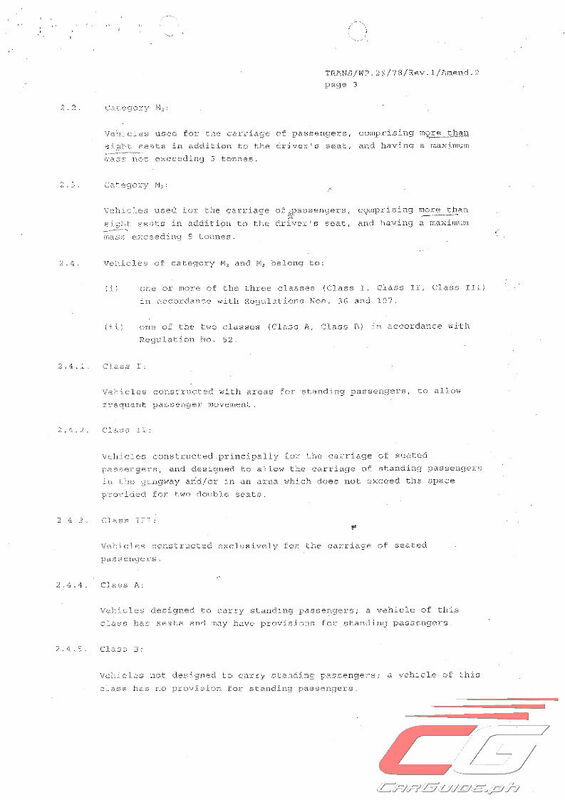 Parang katulad din ito nung panahon ni Abaya regarding Vintage cars, pinagtatawanan na tayo ng MGA taga ibang bansa, parang mga walang kwenta Ang ginagawa ng mga taga LTO. Plate number ko nga hanggang ngayon Wala pa, lampas dalawang taon na Ang sasakyan ko. Pwede bA unahin niyo yung mga pending palpak niyo diyan sa LTO.